For the past few years I have been collecting vintage craft books and kits. 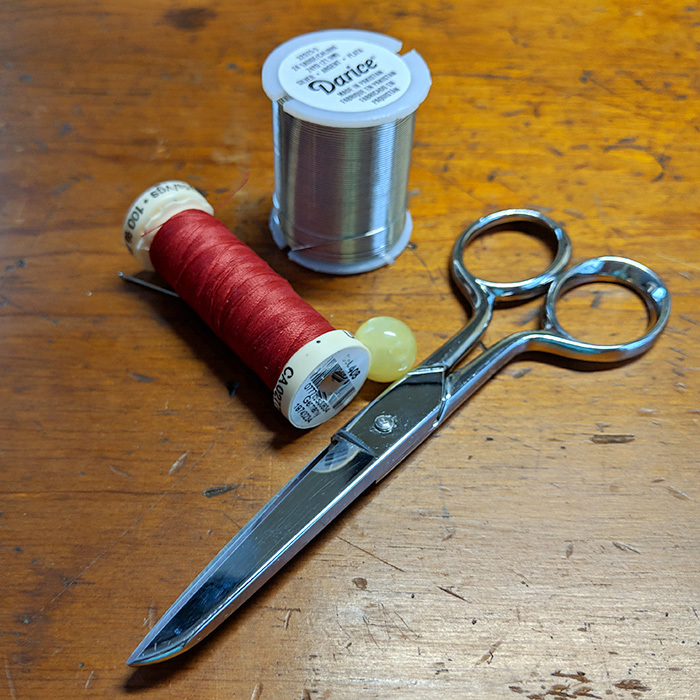 My goal for 2019 is to try at least one craft per month and share them here. 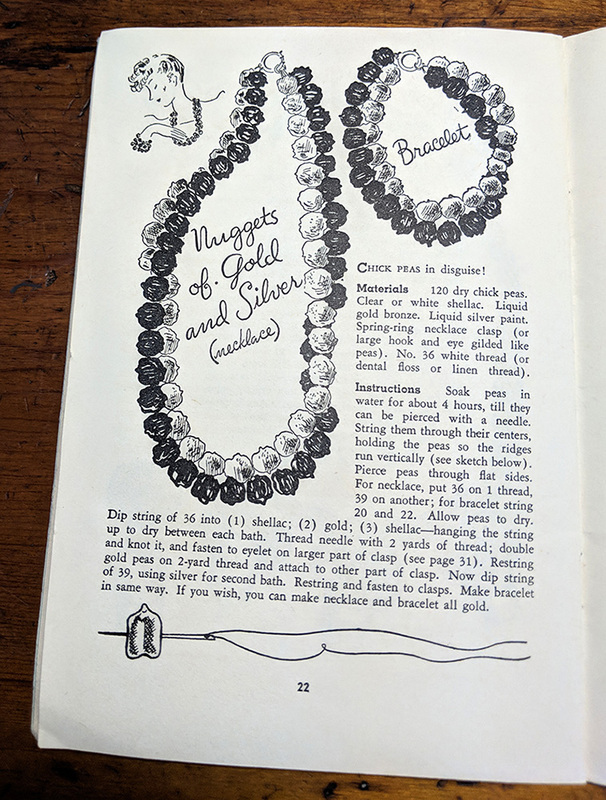 For the month of January, I wanted to start a little book from 1939 titled "Costume Jewelry you can Easily Make", by Natalie Morgan, Illustrated by Clara McCanna. 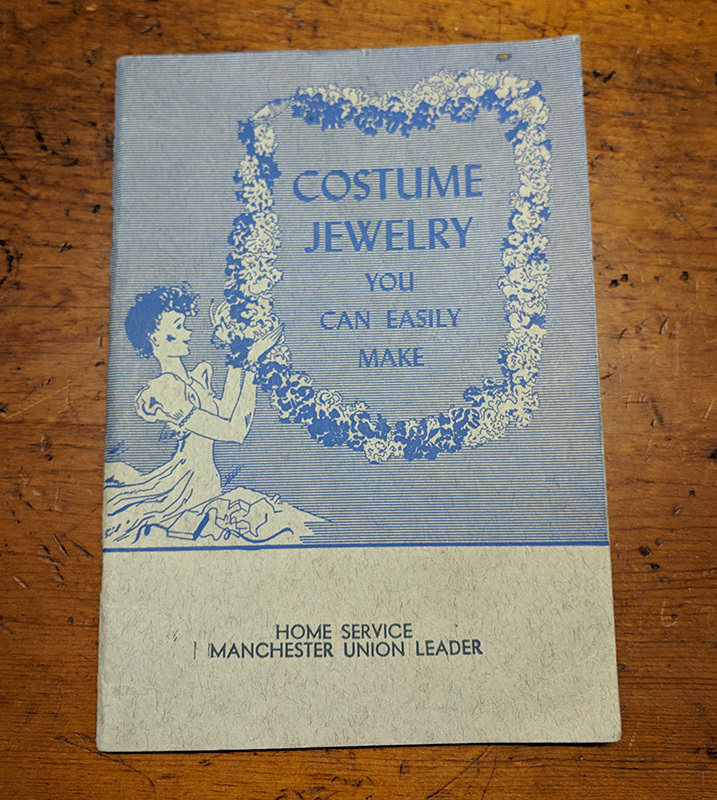 This little book has instructions for 26 different projects for making necklaces, bracelets, belts and brooches. The jewelry is meant to be made from items commonly found around the house or easily purchased at the grocery store. There are instructions for making jewelry from things like popcorn, pasta, chick peas and jelly beans. Therefore, I suspect that much of the jewelry will probably look as if it were made by a grade schooler. Instructions for the Popcorn Coral necklace. I can’t imagine the resulting necklace will look like anything but painted popcorn. Instructions for the Nuggets of Gold and Silver necklace and bracelet. This one is made with painted chick peas. There are a few projects with potential, so for my first project I chose to make the Flower Pot Necklace. I’m already a huge fan of this general style of vintage necklace, so this looked like something I would actually wear. This necklace is made from yarn, thimbles and a single button, which fortunately are fairly easy things to find. The instructions for the Ivory Grape Boutonniere and the Flower Pot necklace. Like the Flower Pot necklace, I think the Grape Boutonniere is one of the better designs in the book. The instructions called for five different colors of yarn. Since I’m not a knitter, it would have been expensive and wasteful to purchase full skeins of yarn in the colors I needed. Fortunately, my local craft store happened to sell packs of mini-skeins which was perfect for what I needed. I purchased a bag of vintage thimbles from a local antique shop which had printing on them, so I removed that with acetone. Acetone will melt plastic, so I needed to work quickly to remove the printing, without the plastic dissolving. Instead of a chain, this necklace uses a cord. There were instructions for making the cord from yarn however I found that yarn was a bit too fuzzy. Instead, I made the cord from red embroidery thread. The result was a much tighter and smoother cord. The clasp of the necklace is made from attaching a ball-style button on one end which slips through the natural loop formed at the other end. The top cord is made with yarn and the bottom cord with embroidery thread. The “flowers” for the necklace are made from pompoms. The book included instructions for making the pompoms, but the resulting pompoms looked more like tassels. So, I found instructions for making small pompoms using a fork which looked much better. 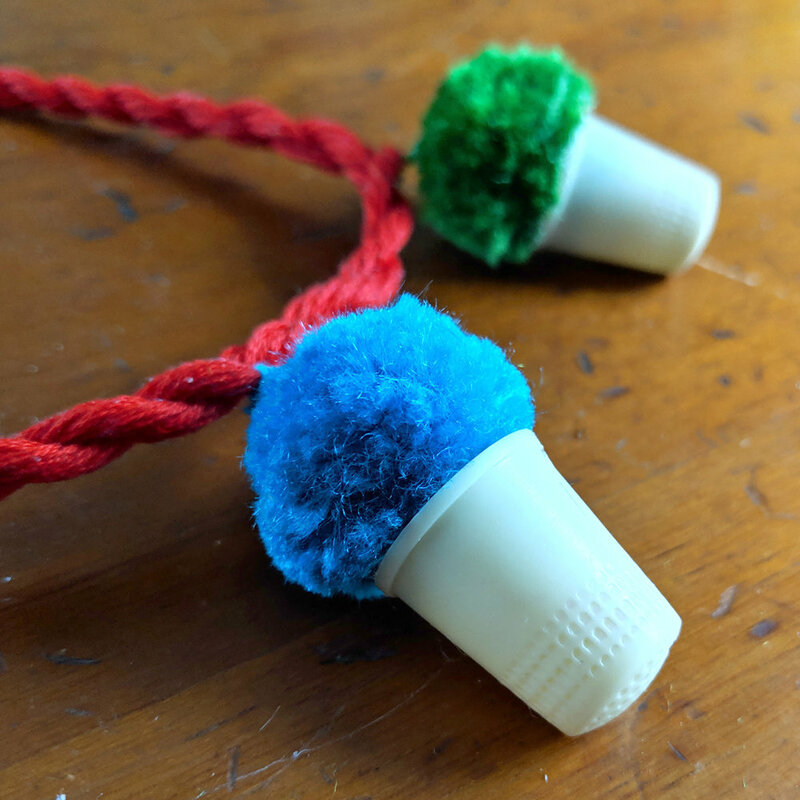 After tying a loop of embroidery thread around each pom-pom, gluing them to the thimbles and tying the loops to the rope, I had my Flower Pot Necklace. I actually like the way this came out. It’s really fun and whimsical reminds me of potted mums. The suggested colors worked with many of the vintage and retro clothes I already had which is a nice bonus. This project got me thinking about how I could take the general idea and improve upon it. So, I came up with an idea for making a potted plant necklace. I wanted the plants to look like a variety of cacti and succulents and considered a number of ways to make them, including using polymer clay. However, I was afraid that clay would be too brittle. I happened to have some felt scraps in the colors I needed and thought that would work well. I sketched out my designs first and used those as a guide to create the patterns. I sewed the pattern pieces together and used embroidery thread to add detail to the different pieces. For the “dirt” I used scraps of brown fabric and sewed those to the bottoms of the plants and then glued everything to the thimbles. I sewed jump rings to the tops of all the plants and attached them to the necklace. I’m really excited about how my potted plant necklace came out and I’d love to do this again with some different designs. I also think these mini plants would make really fun earrings or a brooch. I wrote up instructions for both the original design and the potted plants design, for anyone who wants to make their own. A close-up of the final potted plants necklace. Modeling my potted plants necklace.